So it all came down to this. One young woman and an army of misfit toys vs. the assembled might of the nine members of The Junior Super Patriots, West Coast Division who had come to take her down. 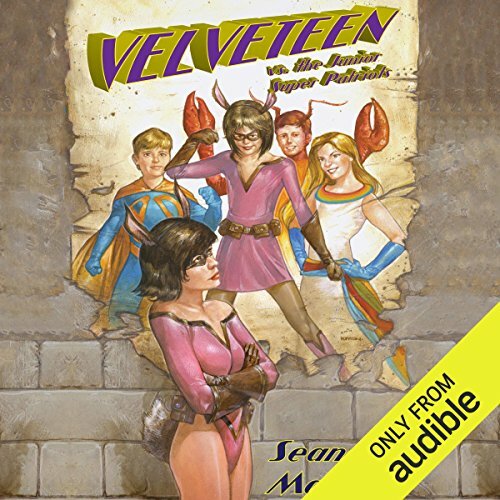 Velveteen lives in a world of superheroes and magic, where men can fly and where young girls can be abducted to the Autumn Land to save Halloween. Velma lives from paycheck to paycheck and copes with her broken-down car as she tries to escape from her old life. It's all the same world. It's all real. And figuring out how to be both Velveteen and Velma is the biggest challenge of her life, because being super-human means you're still human in the end. Join us as award-winning author Seanan McGuire takes us through the first volume of Velveteen's - and Velma's - adventure. ©2012 Seanan McGuire (P)2013 Audible Inc. This book is so much fun! It's not really a novel, per se, but neither is it really a series of short stories as some readers claim. It definitely has a "serial" feel to each "chapter" though. This book reads more like a mix of superhero "info guide", flashbacks, and short current day vignettes revolving around Velma Martinez, "aka Velveteen". Whatever it is, it works. Or at least it worked for me. Light and fun, I found myself laughing on several occasions. Narrator Allison McLemore does a great job with all of the voices. If you like quirky superheroes and humorous writing, I'd give this a try. Definitely worth the audible credit or cash. Looking forward to the next Velveteen collection. I generally enjoy Seanan McGuire's writing but actually put off this book for a long time since the idea of a bunny superhero sounded a little too cutesy for my taste. I feel like I should apologize to the author for ever doubting her. This series of stories blends humor and real life trials together wonderfully and draws you into the world of the super heroes as they live very real lives. About half way through listening I had gone and bought the second book in the series to listen to since I just knew I would get to the end and need to hear more. I really wish that there had been more to this book, because it had a lot of potential. Unfortunately, the author has gotten a little too caught up in the premise of the character Velveteen and has forgotten to really include any plot in the book. Velveteen goes to Oregon. It's not much of a plot. The well thought through back story and interesting superhero incorporation concept makes the book not a total loss, fortunately. If the book had done a better job of winding the back story into an actual plot, it could have been excellent. It's not that it's not an enjoyable listen, but it lacks the stakes which make a real page-turner. It also ends pretty abruptly, I assume in an attempt to make you want to buy the second. The narration was excellent. The other problem I had with the book was the strange introduction and mini essay at the end of the book. The intro basically talks about how someone (the narrator I think, but possibly some editor) liked the concept, but if you've read the description of the book, it's pretty unnecessary. The closing essay was just unnecessary and strange, all about the nature and history of superheros. This was a wonderful read that was humorous and highly entertaining while at the same time being thoughtful and heartfelt. I am a huge fan of Seanan McGuire and I enjoyed this just as much as her Incryptid and October Daye series. This is a series of stories following Velma as she travels from Southern California to Oregon; there is a loose plotline but this is very much a set of stories...not really a book. I listened to this on audiobook and the audiobook was incredibly well done. I would definitely recommend listening to on audiobook; McLemore sounds exactly like I imagine Velma would and does a great job with character voices and emotion. The whole story is set in an alternate reality where superheroes exist and are heavily marketed with the majority being controlled by a large corporation. There are a lot of interesting issues addressed from very real issues (like corporate monopolies) to more fantasy issues (how does a superhero who can animate toys find a guy who understands her). Additionally there are questions about identity; who is Velma? Is she Velveteen or is she Velma? Is she something in between? I loved all the characters in this book, even the side characters have a lot of depth and are completely real. I loved the world and thought this was an amazing read. Overall I really enjoyed this story collection and look forward to reading the other Velveteen vs. collections. I would recommend to those who enjoy superhero stories with a human touch to them. The book is also pretty funny at times so I would recommend to those who enjoy humor in their stories as well. This is so much more than just a fun super hero book. It deals with corporate manipulation and the all to relatable struggle to live a life separate from the rules that seem to govern how we can. While taking place in a fictionalized version of America, there is a grounded universality to the characters and their struggles that transcend the genre. Didn't know what to expect, but liked it. Yes. It kept me engaged. Excruciating material mixed in with the fluffy fun. Light hearted mostly which is what I was looking for. I love Seanan McGuire in general. I started with October, went to Mira Grant's parasitology, and then Indexing, and Sparrow Hill Road, I hesitated on this series because I thought it was YA and graphic novel. It seemed like something I would feel Meh about. (TBH, I am meh on Incryptid, but I have only read the first novel and a few short stories, maybe it picks up if I give it a chance). I started this book because it was Seanan and, in the end, I was willing to take a chance on something she wrote. I was totally wrong to hesitate. This series is wonderful, honest, and written for someone like me (who loves character-driven stories of the fantastic). This was an excellent collection of stories tying together the narrative of Velveteen, the toy-animating superhero. Bottom line, trust Seanan McGuire to tell you an excellent story. Don't worry about the topic or the setting. She will take you on a journey every time. And every time, you will be glad you went with her. I could not handle the performance of the person reading the book. Returned after a few minutes of listening.